From my perspective, the big news this week was the start of senate hearings on gun violence, which evoked a wide range of passions across the spectrum of public opinion. More poignant than any testimony in Washington was the death of Hadiya Pendleton, a 15 year old honor student who performed at President Obama’s inauguration on the 21st. The day before the speechifying began, Hadiya was shot and killed in public park in a “nice” section of Chicago, about a mile from the president’s house. Police think it was a case of mistaken identity. I thought of Hadiya Pendleton as I was out walking the dogs in a “nice” local park. I remembered a lecture one of my psych professors gave 20 years ago. We were studying defense mechanisms, and of these, repression gets a lot of bad press. Nobody wants to be repressed or live in a repressive society. The human psyche has not changed in 100 years, but our world has altered dramatically. Men no longer need to wear boiled shirts, and women are free to bare their ankles. We’ve learned to embrace the individual conscience and the search for an “authentic me,” but we don’t know what to do if someone’s “authentic me” turns out to be a sociopath. We’ve found out the hard way that you can’t just unrepress the good stuff. When we let our angels out of the box, the demons get a pass too. Which brings to mind the story of Pandora. 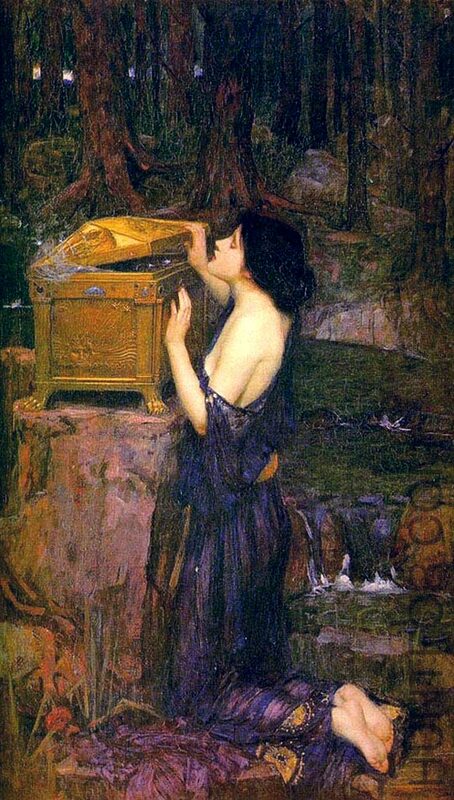 In order to punish humans for Prometheus’ theft of fire, Zeus sent Pandora to earth with a sealed jar (later mistranslated as “box”) and instructions not to open it. We all know what happens in folklore with orders like that. By the time Pandora got the lid back on, all the evils of the world had been released. Only hope remained in the jar. Pandora’s dilemma is ours. When it comes to our violent behaviors, inhibition was not such a bad thing. Now that it’s out of the box, the question becomes, what do we do with our hope? This entry was posted in Current Events, Myth, News, Psychology and tagged Culture, Events, Myth, News, Pandora, Psychology. Bookmark the permalink. You have once again excelled in explicating and reflecting on a social issue, so much so that I have now decided to follow your blog. Thank you. Indeed, there are substantive ongoing issues in psychology, psychiatry and pharmacology, and you have outlined, or rather, exposed one of them here. You’ve put your finger on one of the big conundrums for liberals: how to safeguard individual freedoms while safeguarding individuals from those who abuse those freedoms. Saddening to hear of Hadiya’s death, and no real excuse for ‘mistaken’ identity: no one deserves to die a violent or even avoidable death. We had a very disturbing article in the local paper over the weekend discussing a small section of this city where gun violence is so endemic that the entire population follows its rhythms, e.g., indoors with the doors locked after dark. Since most of the violence happens with handguns, many of the proposed laws won’t affect such neighborhoods. The one exception is background checks for all types of sales in all states. An earlier editorial focused on why the National Rifle Assn. opposes even these measures. It’s not a second amendment issue, the writer said, but is a matter of pure profit. Strangely enough, considering the headlines, the number of homes with gun owners has been dropping, from 52% in 1970 to something like 32% now. I’m not sure much change is going to happen right now, but at least the debate is out in the open and drawing headlines. No one can duck awareness of the problem anymore. Will this issue and its ramifications come to characterise Obama’s second term, in the way that the abolition of slavery characterised Lincoln’s presidency? Let’s hope it doesn’t end as badly. Spot on, as he always is. Thanks Tish. I guess I’ve always been optimistic, that compassion lies at our core. We even see examples of that in the movements Gandhi and Martin Luther King led. A big difference is that they could identify concrete actions to take to change a definable situation, whereas with gun violence it’s not that easy. Scratch the surface and I think the real culprit is not the NRA, but fear. I say that because not long after the Sandy Hook shootings, Walmart announced that they had to limit their sales of ammunition or run out. As a nation, we’re armed to the teeth yet feeling less safe than ever, and no one yet knows quite what to do.